Abraham Lincoln was called the Great Emancipator because his proclamation of 1862 gave freedom to the slaves. In that same year, he signed another extremely important document that gave land to free men. 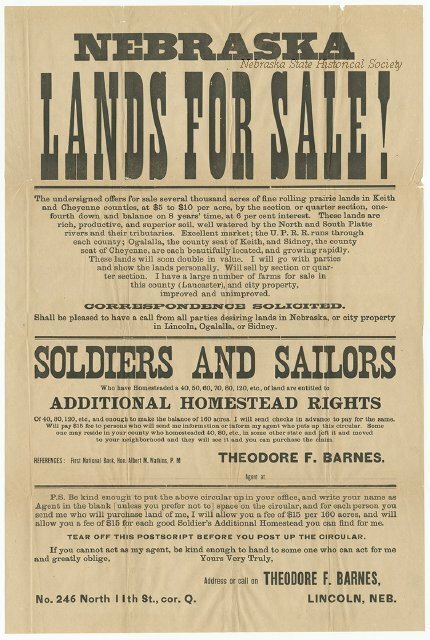 No single act had more effect on the Middle West and Great Plains than the Homestead Act of May 20, 1862. It brought tens of thousands of land-hungry settlers to the region that was to become the nation's breadbasket. Millions of acres from the public domain became available. Under this law heads of families had only to pay a small filing fee and live upon and cultivate their 160 acres for five years. For some the rigors of frontier life were too great, but many others replaced the prairie grasses with grain, and built homes, often of sod, on land of their own. The Homestead National Monument of America, a part of our National Park System, is located on the Daniel Freeman homestead seven miles west of this site. It commemorates this act and the policies of government that played a major role in the settlement of the West. “Homestead Movement,” Explore Nebraska History, accessed April 19, 2019, https://mynehistory.com/items/show/229.